If you would like to restore your smile while avoiding some of the problems associated with traditional tooth replacements, dental implants could be right for you! In addition to giving you back a full smile, dental implants also correct many of the problems associated with missing teeth, such as improving speech and restoring the natural contours of the face. At Dental Works in Scottsdale, AZ, Dr. Terry Work and Dr. Mary Ann Work are your dentists for dental implants! Dental implants help restore your smile by acting as roots to anchor artificial teeth in place. Dental implants can be used with dental crowns to replace individual teeth or they can be used with implant-supported overdentures or bridgework to replace multiple teeth all at once. Dental implants are metal posts that are anchored in the jaw bone. Over time, the post and bone permanently fuse together, which enables the dental implants to securely hold artificial teeth in place, eliminating any worry that the pieces will slip out of place or come loose. There are many ways dental implants can help beyond just restoring your smile and giving you a confidence boost, as they can address many of the problems associated with having teeth missing. One huge benefit is how filling in gaps with dental implants and artificial teeth can correct the speech deficiencies caused by absent spaces. Another consequence of having teeth missing is that there is less support for the muscles of the face, which can result in drooping and sagging. When the cheeks droop or sag, the natural shape of the face becomes altered. Choosing dental implants to replace missing teeth and fill in the gaps can restore the natural shape of the face. Dental implants can also reduce the strain on your existing natural teeth. When there are gaps in your smile, the remaining teeth have to compensate for the missing ones and take on the additional work of biting and chewing. This extra work results in more strain on the remaining teeth, as well as additional wear and tear. An additional benefit is how they are long-lasting. Dental implants are made from a durable and hypoallergenic metal, and since they fuse with bone in the jaw area, they can potentially last indefinitely. Your Scottsdale dental implants can help you decide if dental implants are the right choice for you. 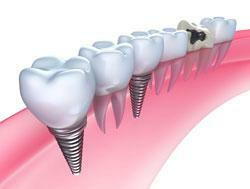 For dental implants in Scottsdale, schedule an appointment with Drs. Terry or Mary Ann Work by calling Dental Works at (480) 391-0099.